Thank you so much for your interest in At Vitoria! Marcia Selz would be delighted to connect with your book club by phone, via Skype or, if possible, in person. with the words “Book Club” in your subject line. In your message, please indicate: 1) the number of people in your group; 2) the phone number and/or Skype address at the location where your group will meet and 3) the city/state where the discussion will take place. You can also contact Marcia by phone at (310)-749-0247. Please also give three potential dates and times (please specify the time zone). Whether you’ll be inviting Marcia to join you or not, here are some questions that you may find helpful in guiding your group’s discussion of At Vitoria. Are Jews really different? Do they always need to take care of themselves? Can Jews be fully integrated into a society? Why/Why not? When Benjamin says to Michael, “It’s time. We’ll never move back to Vitoria,” Michael becomes angry. (See the prologue.) Do you believe their perspectives on the cemetery are justified? If you were a Crevago and had to vote, whom would you most agree with–Michael or Benjamin? What would be your compelling points-of-view? Vidal goes to see Benjamin before going to see Della. (See chapter 1.) What does this tell you about the relationship between the brothers? What does it tell you about the relationship between Vidal and Della? How do these relationships change over time? Do you think that Vidal should have moved away from Vitoria, even if Benjamin did not want to go? When Vidal visited Antonio in Segovia and watched as his children declared their loyalty to Judaism (see chapter 3), what feelings did you get? How do you compare these feelings to your own relationship with religion? Should Vidal have insisted that Della take in Antonio and Maria’s children? Why do you say this? How would you describe the evolution of Father Joaquin’s and Sister Angelica’s attitudes toward Jews? (See chapter 7.) Have you ever experienced attitude shifts like this? Describe and compare. Why did the Crevago family stay in Vitoria after Vidal described pogroms and pillaging in other Spanish cities? How do the behaviors of the Crevagos compare to those of families who did not leave Germany after the rise of the Nazis? How did Vidal change his views of religion? Would you have reacted the same way? Why/Why not? Compare and contrast the procession of the Inquisition (Chapter 5) to the procession of Isaac’s funeral (Chapter 7). What can you learn from each? Thank you again for your interest in At Vitoria. If you’re so inclined, please share your thoughts about the book in a review on Amazon.com, or your book site of choice. 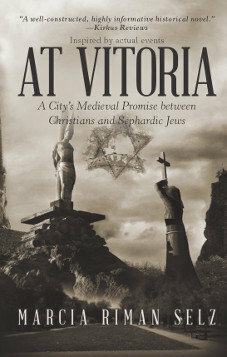 Help others learn about At Vitoria, and encourage them to read the book!